Here is some good news for all you people out there who always wanted to email your friends and family in your native language. 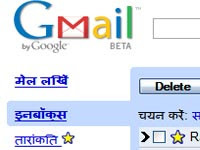 Google has launched a new feature in Gmail that makes it easy to type out emails in indian languages. When you compose a new mail in Gmail, you will now see an icon with an Indian character. This feature is enabled by default for Gmail users in India. If you do not see this function enabled by default, you will need to go to the "Settings" page and enable this option in the "Language" section. When you click the Indian languages icon, you can type words the way they sound in English and Gmail will automatically convert the word to the selected Indian local language equivalent. Gmail currently supports five Indian languages -- Hindi, Tamil, Telugu, Kannada, and Malayalam -- and you can select the language of your choice from the drop-down list next to the icon. Arabic, Bengali, Bulgarian, Catalan, Croatian, Czech, Danish, Dutch, Estonian, Finnish, French, German, Greek, Gujarati, Hebrew, Hindi, Hungarian, Icelandic, Indonesian, Italian, Japanese, Kannada, Korean, Latvian, Lithuanian, Malay, Malayalam, Marathi, Norwegian, Oriya, Polish, Portuguese, Romanian, Russian, Serbian, Simplified Chinese, Slovak, Slovenian, Spanish, Swedish, Tagalog, Tamil, Telugu, Thai, Traditional Chinese, Turkish, UK English, US English, Ukrainian, or Vietnamese. 3. Select a language from the Gmail display language: drop-down menu in the Language section. The Gmail interface will appear in the language of your choice after you click Save Changes. However, your Gmail's display language doesn't affect the language in which your messages are sent and received. Some of the features available in the English language setting may not be available when you select another language setting. Google added that it's working towards making all of Gmail's features available in every language setting.